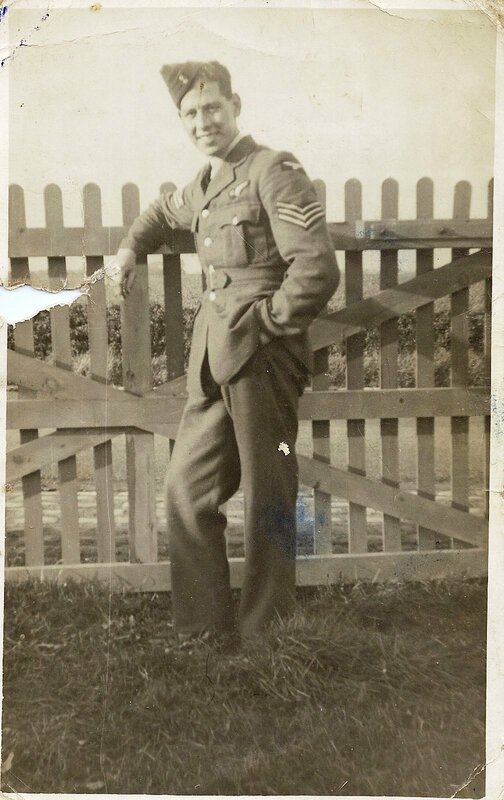 Many thanks to Paul for passing on this fantastic picture of Tom Darbyshire, Dad’s Mid Upper/ Rear Gunner during his first tour with the Squadron in 1943. Paul received the picture from his Aunt, one of 2 surviving sisters of Toms. Date and location of the photograph are unknown. In the email with this picture was an interesting question from Paul. He wondered if there was any reason why Tom swapped with John, the crew’s original Rear Gunner half war through their tour. I personally have no idea why they decided to – maybe superstition, perhaps a gentleman’s agreement. Certainly I think the rear gun turret was considered the coldest, loneliest and most dangerous place in a Stirling – and you probably wouldn’t want to spend any longer in the position than you had to……..
Funnily enough Pauls question also jogged my memory that I had realised on receiving Tom’s logbook that the ORB’s were incorrect – consistently recording John Hulena as the Rear Gunner. 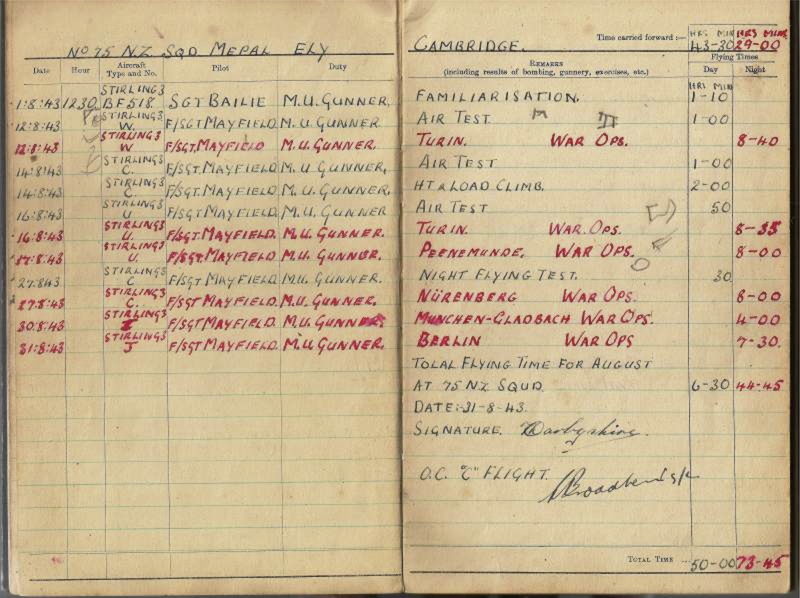 Having spent some recent weeks beginning to convert the 1943 ORB to a database, it has struck me what an appalling inaccurate document it is – Toms logbook shows another mistake – I wonder how many there are that we will never know…….. This entry was posted in general and tagged 1943, 195 Squadron, 75(NZ) Squadron RAF, A. Warburton, Allan Mayfield, Aviation, Baille crew, Bomber Command, Jack Jarmy, Jack Thomson, John Hulena, Mepal, Robert Douglas 'Jock' Sommerville, Thomas Darbyshire, William Lake, World War 2, Wratting Common on September 13, 2013 by 75nzsquadron. Oh my gosh – has it happened again ?!? 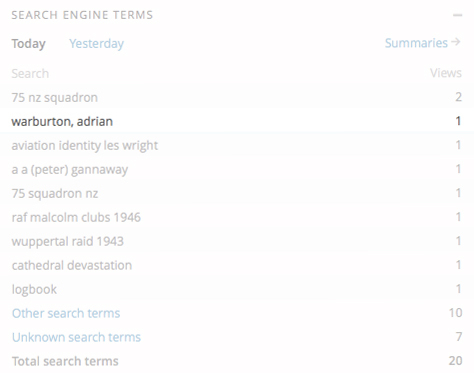 Search terms for this morning…….. Some of you might recall a similar screen grab from the blog statistics I put up a few months ago when someone put in a search for Thomas Darbyshire. That time, it ended up being fantastic news – it was the nephew of Tom and I finally had a christian name for Sgt. Darbyshire. Am I hoping too much this might have just happened again, this time for Sgt. 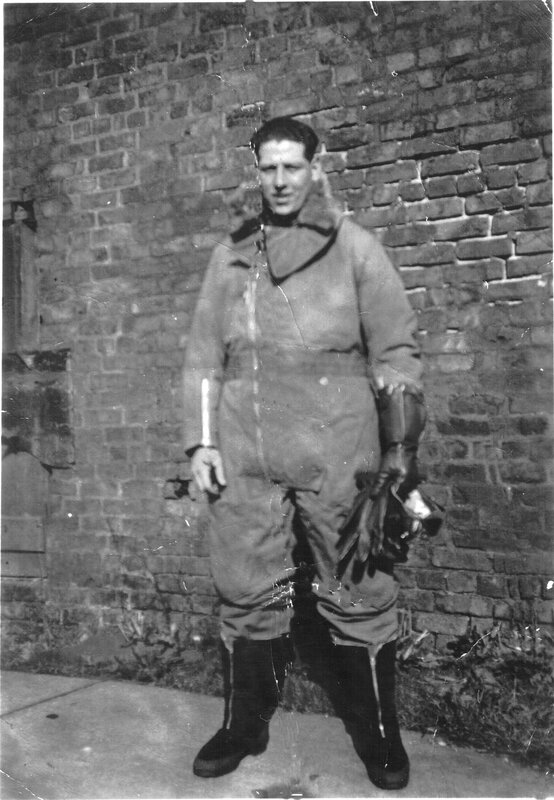 Warburton, Flight Engineer with the Mayfield crew in 1943? Please, as before, if he is, let me know………. This entry was posted in general and tagged 1943, 195 Squadron, 75(NZ) Squadron RAF, A. Warburton, Allan Mayfield, Aviation, Jack Jarmy, John Hulena, Mepal, Robert Douglas 'Jock' Sommerville, Thomas Darbyshire, William Lake, World War 2 on July 24, 2013 by 75nzsquadron. Perhaps not an obvious connection, based on the title of this post, however there is a strong one. After I had visited Jack Jarmy last summer, I came across a website for 218 Squadron. 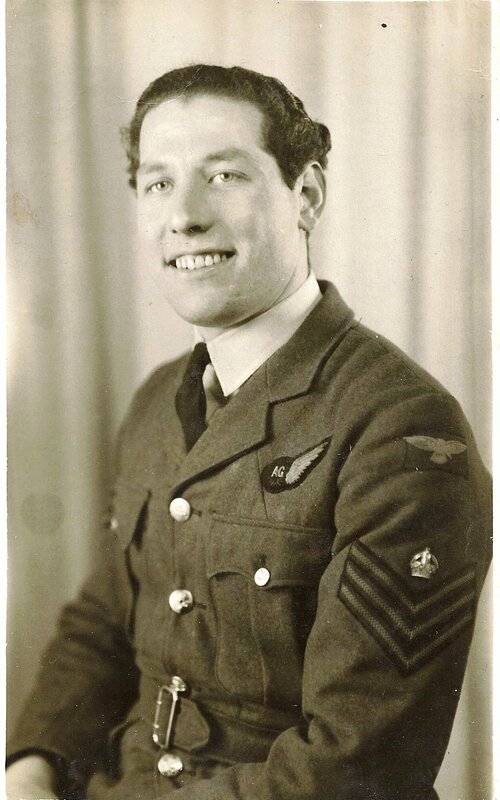 Within it, there was a visitors book, so I registered and left a message just letting everybody know that Jack, who completed his second tour with the Squadron, was still alive and well. To be honest, I had completely forgotten that I had even left the message. That is, until today when Doug contacted me from Australia to say that his father, Len Gillies, Jack’s Air Bomber is also still alive and well. Doug was blown away by first finding my message and then finding Jack’s information on the blog. Hopefully Jack and Len might get together after all these years again. 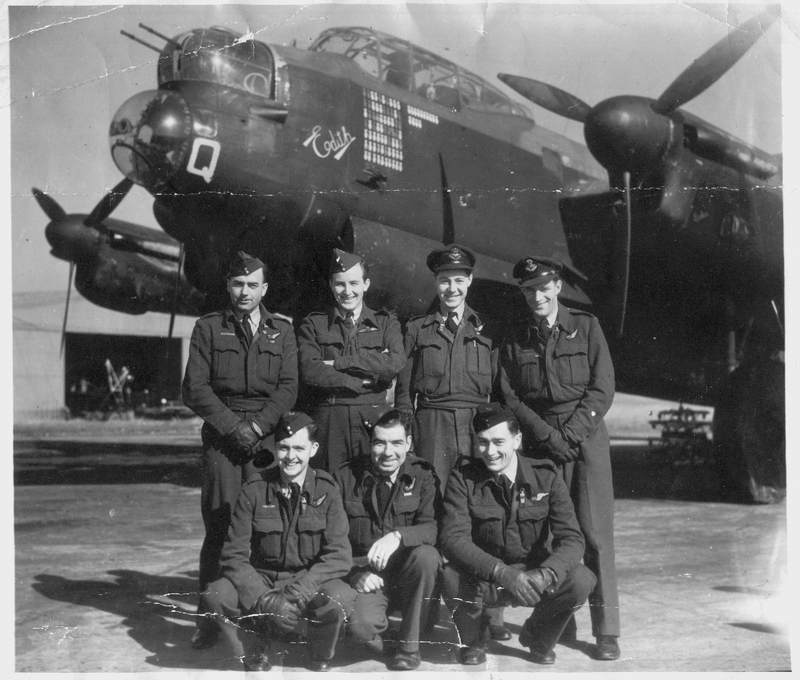 As well as the wonderful crew picture above, Doug also has passed on the image below showing the crew, once again in front of ‘Edith’, but this time also including the ground crew. From left to right: Geoff Ginn, Jock Lees, Clarence Ormisher, Maurice Guinane, Jack Jarmy, Leonard Gillies and Kevin Roberts. And finally another picture of ‘Edith’, being worked on by Ground crew, form the Imperial War Museum. Mechanics at work on an engine of Avro Lancaster B Mark III, LM577 ‘HA-Q’ “Edith”, of No. 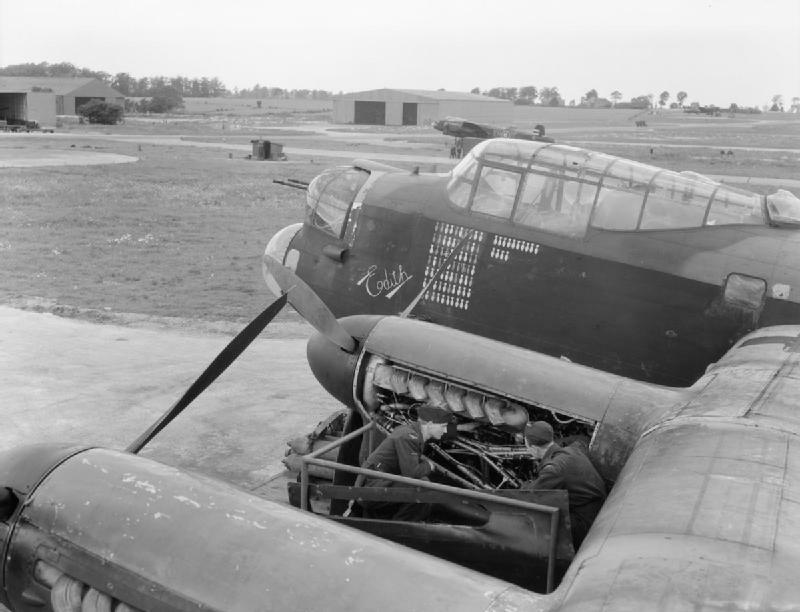 218 Squadron RAF on a pan hardstanding at Chedburgh, Suffolk. “Edith’s” sortie tally shows a total of 84 bombing operations achieved with Nos. 622 and 218 Squadrons, in addition to which the aircraft also flew 14 food-dropping and prisoner-of-war repatriation sorties to and from Holland in May 1945. By this time relegated to a training role, LM577 completed more flying hours than any other Lancaster on the station. This entry was posted in general and tagged 1945, 218 (Gold Coast) Squadron, Aviation, Bomber Command, Chedborough, Clarrie Ormisher, Geoff Gin, Guy Guinane, Jack Jarmy, Jock Lees, Kevin Roberts, Len Gillies, World War 2 on March 20, 2013 by 75nzsquadron. Many many thanks to Paul for continuing to pass on information about his Uncle, who was the Mid Upper Gunner with my fathers first tour crew in 1943. Tom was born on the 15th of May 1922 in Rivington Lancashire. After leaving school he worked as a farm labourer. Sometime in 1940 Tom and his best friend Peter Riley volunteered at the Omskirk Labout Exchange – Peter joined the army, but sadly subsequently killed in action. Norfolk with his wife, whom he had met while in the RAF. Tom Darbyshire sadly he died of cancer in Northwood, Middlesex in 1994 at the age of 72. This entry was posted in general and tagged 1943, 195 Squadron, 75(NZ) Squadron RAF, A. Warburton, Allan Mayfield, Aviation, Baille crew, Bomber Command, Jack Jarmy, Jack Thomson, John Hulena, Mepal, Robert Douglas 'Jock' Sommerville, Thomas Darbyshire, William Lake, World War 2, Wratting Common on March 18, 2013 by 75nzsquadron. If it wasn’t amazing enough to hear from Paul, the nephew of Tom Darbyshire, Dad’s Mid Upper Gunner out of the blue a few days ago, it only got better when he instantly and very generously supplied a copy of his Tom’s logbook. The arrival of his book means I now have 3 of the Mayfield crew logbooks, with I hope, another on its way at some point in the future. As such, this is the most complete set of a single crew that I have so far. This entry was posted in general and tagged 1943, 195 Squadron, 75(NZ) Squadron RAF, A. Warburton, Allan Mayfield, Aviation, Baille crew, Baillie crew, Bomber Command, Cyril Baillie, Jack Jarmy, Jack Thomson, John Hulena, Mepal, Robert Douglas 'Jock' Sommerville, Thomas Darbyshire, William Lake, World War 2, Wratting Common on March 15, 2013 by 75nzsquadron. 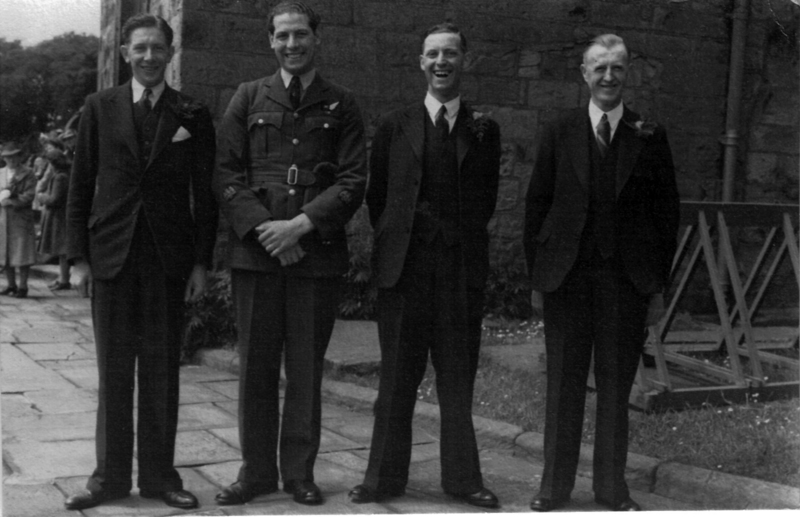 Warrant Officer Thomas Darbyshire, 2nd from left, best man to his older brother Henry (on Tom’s left). On the far right of the photograph is a friend of the family, Tom Draper and on the left of the photograph, Tom Draper jnr. Regular readers will have seen my post regarding my chance discovery on Monday, that someone had been brought to the site on a search term ‘Thomas Derbyshire mu gunner‘. I was so excited that this might be the same Sgt. T. Derbyshire that flew with Dad, that I posted a ‘plea post’ on the blog to ask them to contact me. I was blown away to hear from Paul yesterday, with conformation that yes, indeed Thomas was the same and that as he had his uncle’s logbook, there was no question about it. I find this contact all the more poignant as I set myself the objective of at the very least, knowing the christian names of all the boys that Bob flew with – now I can finally talk about ‘Tom’. Tom Darbyshire and Bill Lake joined the rest of the boys over the period of 2 consecutive raids (ironically both) to Turin in August of 1943. The boys had lost their original pilot, Jack Thomson on his second ‘2nd Dickie’ op with the Bailie crew on the Hamburg raid of 2nd August. Once again, many thanks to Paul for getting in contact with me and adding another little piece to the puzzle. 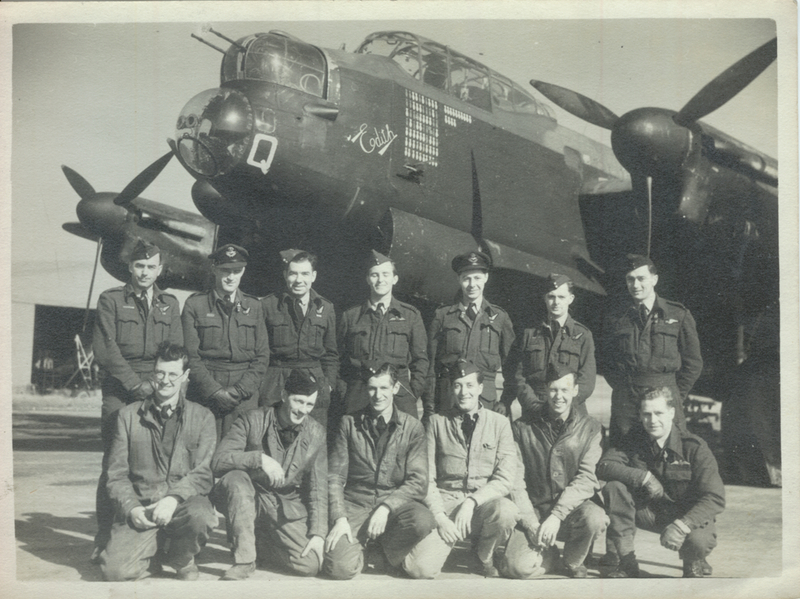 This entry was posted in general and tagged 1943, 195 Squadron, 75(NZ) Squadron RAF, A. Warburton, Allan Mayfield, Aviation, Baille crew, Bomber Command, Jack Jarmy, Jack Thomson, John Hulena, Mepal, Robert Douglas 'Jock' Sommerville, Thomas Darbyshire, William Lake, World War 2, Wratting Common on March 14, 2013 by 75nzsquadron. Perhaps an inevitable outcome of a blog like this is that from time to time I do get a bit obsessed about visitor counts etc. 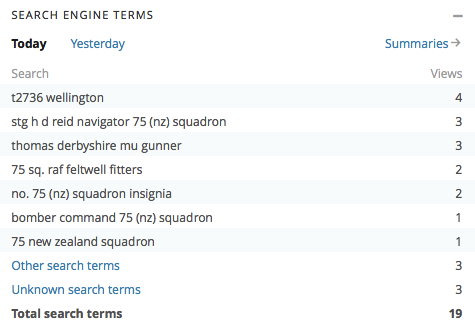 A quick peruse this afternoon led me to scroll down to the search terms that have led visitors to the site and I was amazed to see a search for ‘Thomas Derbyshire mu gunner’. I am hoping against hope that this is the same T. Derbyshire that was a MUG with Dad on his first tour in 1943……. My discovery and now the wait is all the more excruciating – Sgt. Derbyshire was the only airman in the Squadron with that surname and the same search in Google throws up no other instant possibilities – is it too much to hope ? Please, please, if the person/ people that typed in this search see this post contact me – I really want to be able to put a christian name to all of the boys that flew with Dad at the very least. This entry was posted in general and tagged 1943, 75(NZ) Squadron RAF, A. Warburton, Allan Johnson Mayfield, Aviation, Bomber Command, Jack Jarmy, John Sebastian Hulena, Mepal, R. Weaver, Robert Douglas 'Jock' Sommerville, T. Derbyshire, William Lake, World War 2 on March 11, 2013 by 75nzsquadron.